This is the first of two calls for proposals from the UK Research and Innovation (UKRI) Physics of Life Strategic Priority Fund to support internationally leading research that requires collaborative, interdisciplinary working to address key challenges at the interface of physics and the life sciences. This call will fund high-quality proposals that demonstrate deep integration of cutting edge experimental, theoretical and/or computational physics with life sciences research to advance our understanding of living systems in biological or biomedical contexts. This UK Research and Innovation (UKRI) call, led by EPSRC with support from BBSRC and MRC, is making available up to £15 million, to include £13.2 million of resource funding and £1.8 million of capital funding. This call is open to staff of UK institutions who are eligible to receive funding from UK Research and Innovation (UKRI) as well as Public Sector Research Establishments (PSREs). Multi-institution applications are permitted. Applicants interested in applying to this call must complete the intention to submit form on the call website by 16:00 on 15 January 2019. This information will primarily be used to manage potential conflicts when selecting the panel. Applicants will receive an email from UK Research and Innovation (UKRI) by 16:00 on Friday 18 January 2019 confirming our expectation that they will submit a full proposal. Full proposals must be submitted by 16:00 on 12 February 2019 and will be assessed directly by an interdisciplinary expert peer review panel from across the physics and life sciences communities. We envisage high demand for funding, therefore we strongly discourage the premature submission of proposals which may benefit from further development in anticipation of the second Physics of Life call, which will be of a similar scale. This NSF-BIO, USDA-NIFA and BBSRC Joint Activity is soliciting Early Concept Grants for Exploratory Research (EAGER) proposals to support development of breakthrough ideas and technologies to speed the development for new crop varieties. There remain significant bottlenecks to improving crop varieties even if new traits or natural variants are identified, such as producing hybrids, understanding recombination, and epigenetic inheritance as examples. Translation of basic knowledge to practical outcomes can be accelerated by key emerging technologies that exploit genomics rapidly and effectively. This EAGER opportunity invites proposals to overcome these barriers to crop breeding in highly innovative and transformative ways. Investigators considering this opportunity should articulate how the enabling technologies would be used to improve crop breeding. For this EAGER opportunity, emphasis should be on developing enabling technologies that will impact crops or model crop systems. Projects that focus solely on sequencing will not be considered. Funded projects relevant to the goals of the International Wheat Yield Partnership (IWYP) will be invited to become IWYP Aligned Projects. Proposed studies should be potentially transformative and must be considered "high-risk, high-payoff" to achieve the goal of making technological breakthroughs to promote crop breeding. Studies should be compatible with the budget (up to $300,000 for US components and up to £200,000 for UK components) and time limits (2 years) of the EAGER funding mechanism. For collaborative US/UK EAGER projects, BBSRC will fund UK researchers up to £200,000 and NSF or NIFA will fund US researchers up to $300,000 including indirect costs. US only EAGERS are limited to $300,000 total including indirect costs. Further details are provided below for budgetary limits for UK partners. EAGER proposals may originate from US-UK partnerships or from US-only applicants. EAGERs solely involving UK applicants are not permitted. For more information on EAGERs, please review NSF Proposal & Award Policies & Procedures Guide (PAPPG). Fellowships will be hosted at a Host Organisation (usually an Australian University, but other Australian research organisations may also be eligible) and will be a partnership between the Fellow, CSIRO, and the Host Organisation. Fellows will be employed by the Host Organisation but will maintain a strong linkage to CSIRO through a partnering CSIRO Mentor(s) and various joint activities designed to support development of a synthetic biology community of practice across Australia. Fellows will have a Visiting Scientist appointment at CSIRO and may spend a portion of time physically located within a CSIRO research group if appropriate for the Fellowship project. Applications must be submitted by 5pm Australian Eastern Standard Time, Monday 5th March 2018. We strongly encourage women, people of Australian Aboriginal and/or Torres Strait Islander descent, and other minority groups to apply. For this round applications focused on training and knowledge exchange are especially encouraged. The deadline is 24 Nov 2017 for projects led from University of Cambridge or Norwich Research Park with external collaborators welcome. Each successful project will receive up to £5k, with £4k up front and an additional £1k for follow-on and outreach after reporting. PhD students and postdocs are particularly encouraged to apply. A wealth of tools, technologies and methodologies have been developed for plant and cell free Synthetic Biology, including those developed through OpenPlant, the OpenPlant Fund, the Biomaker Challenge and complementary efforts. In the current OpenPlant Fund call, we are encouraging applications for projects that will provide training or knowledge exchange to broaden the use of plant and cell-free synthetic biology tools, techniques and technologies. Information about previous OpenPlant Fund projects are available on www.biomaker.org. For more information see https://www.openplant.org/fund/ and join the upcoming mixer event on Thursday 9 Nov 2017. If you are interested in submitting a proposal or have any questions, please email colette.matthewman@jic.ac.uk. Want to learn more and find collaborators? OpenPlant Fund mixer and a light-hearted look at training! This event provides an introduction to the opportunities and a chance to present your initial proposals and to meet potential collaborators over drinks and pizza. We will also have a light-hearted look at training, including different models and effective communication of technical details. Come along to learn some tips and tricks in this fun and informative training session, and to network and meet potential collaborators. More details to follow. Help will be on hand to answer any questions you might have as the deadline for applications approaches and to find last minute partners for your teams! Synthesis and sharing of useful DNA parts or vectors. The lead applicant must be based at a UK university or research institute, and be of postdoctoral or above status (or have equivalent research experience). International co-applicants, and in particular co-applicants from OECD DAC countries, are strongly encouraged. The British Academy will require applicants to demonstrate that their proposals are ODA eligible. ODA eligibility is an essential criterion – projects will only be deemed eligible for funding if they can demonstrate that they satisfy ODA eligibility criteria. Awards are of one-year in duration and are available for up to £50,000. Funding can be used to support research and/or clerical assistance; research expenses and consumables; travel and subsistence; and networking, meeting and conference costs. Awards are not funded on a full economic costs basis, with contributions to overheads an ineligible cost. Each project will receive up to £5k, with up to £4k up front and an additional £1k for follow-on and outreach after reporting. PhD students and postdocs are particularly encouraged to apply and external collaborators are welcome. The aim of the fund is to promote the development of plant Synthetic Biology as an interdisciplinary field and to facilitate exchange between the University of Cambridge, the John Innes Centre, and the Earlham Institute for the development of open technologies and responsible innovation in the context of Synthetic Biology. Deep Science Ventures is doing something you may have never heard of... We are offering final year PhD students, graduates, and post-doctoral researchers to showcase their deep domain expertise and join building the next generation high tech solutions in biotech, healthcare, agriculture, sustainable energy - you name it. We look for scientific and engineering expertise in combination with enormous passion to solve major challenges to join a 6-month fully funded venture building program. Brainstorm and explore technical and commercial viability of initial ideas with industry experts and potential co-founders, while earning basic wage. If after 3 months you have found the right co-founder(s) and identified an exciting and viable project we invest £30,000 in to a new company and continue to support your growth over the next year. If you don't find the right idea you may re-do the programme, join other teams, join our industry partners or move back in to academia with far greater insight. make an impact. You will also have interest in starting a company. No idea required. Applications are now open for the CSIRO Synthetic Biology Future Science Fellowships, an initiative of CSIRO's new Synthetic Biology Future Science Platform (SynBio FSP). The scheme aims to attract outstanding national and international early-career post-doctoral researchers (equivalent to Academic Levels A and B, or in exceptional circumstances, Level C) to expand Australian research capacity in synthetic biology. A key element of the SynBio FSP is establishment of a collaborative community of practice extending across CSIRO and Australia more broadly, and linking into international efforts in the field. The SynBio FSP is built on a philosophy of responsible development of synthetic biology technology, striving for ethical outcomes and working within the bounds of social acceptance. Applications must be submitted by 5pm Australian Eastern Standard Time, 27th March 2017. BBSRC are inviting applications from eligible researchers to purchase items of mid-range research equipment. Advanced research equipment and the development of capability in its creative use is a key component in maintaining the competitiveness of the UK research base. The RCUK Strategic Framework for Capital Investment ‘Investing for growth: Capital Infrastructure for the 21st Century’ explains the important roles of acquiring state-of-the-art equipment into the science base, and the rapid development of people skilled in its use. The capital equipment budget for this call is approximately £10M. Applications for mid-range equipment costing over the current OJEU threshold (currently £115k net of VAT and import duty, £138k inc VAT) must enhance the capability of the UK research base in areas of science in our remit (see 'Our portfolio' in related links). Applications will typically be from groups of researchers in one or more eligible institutions, for instrumentation to be deployed on a multi-project/multi-use basis. This is a capital funding call; awards will only fund the purchase of equipment and limited installation costs. No resource or other associated costs may be requested, and funding for the costs of research using the equipment should be found through other project funding. Consequently, in order to ensure sustainable equipment usage, applicants need to demonstrate their potential for obtaining continued support, for example via a track record of successful competitive grant funding, or through host institution commitments. Our strategic plan recognises that 'biological discovery is increasingly being driven by ground-breaking technologies, such as high-throughput genomic and proteomic analysis and next generation biological imaging, that generate massive and complex datasets'. To support these technologies, requests for pipelines of associated technologies (e.g. automated high-throughput platforms or workflows) will be supported where they come together to form a connected whole, and where the total cost is over the OJEU threshold (the value of each individual component must also be over £10k). Computing infrastructure proposals should address a need for resources (such as cloud or high-performance computing installations) for large-scale data analysis, e.g. genome assembly, metagenomics and real-time image analysis that build on existing BBSRC investment and funded research activity. Computing equipment may also be requested in support of advanced research technologies where the scale of the data generated will necessitate significant new computing/data management resources (the total cost of the equipment must be over the OJEU threshold and the value of each individual component must also be over £10k). Applications may seek the costs of initial service maintenance contracts, where these can be purchased upfront as part of a package with the relevant equipment. If these are required, they should be itemised as part of the requested equipment costs and must be fully justified. Costs of service maintenance contracts will not be paid beyond the end date of any successful awards. Effective and efficient use of research equipment and instrumentation is dependent on trained staff, particularly where equipment will be available to multiple users. The application must set out the arrangements for the technical support of the equipment and the professional development of the individuals involved, including access to training and sustainability of the technical staff in question. Commitments to staff posts for the running and maintenance of the equipment, as well as for the training of users (where applicable), should be provided in the form of host institution contribution(s). Provision of staff, support and training will form part of the assessment criteria. BBSRC may establish a network of such staff for the consideration of professional development issues and relevant individuals would be expected to participate. Value for money will be an important factor in assessment. Consequently, whilst contributions from the host institution(s) and/or other external sources are not mandatory, they are strongly encouraged. In accordance with the Wakeham recommendations to maximize the use of equipment and to encourage sharing, the arrangements for managing access to the equipment and the prioritisation of its use should be fully described. Award holders will be expected to put arrangements in place for providing advice and support to others wishing to assess the potential of the technology for their own research. Collaboration and the extension of access to the instrumentation to industry and public sector users that would enhance the potential impact of research is encouraged, and any arrangements for this should be explained in the application. Where more than one instrument of a similar type or application is funded through the 16ALERT call, or where a range of capabilities is established that are applicable to the same research field, we may expect grant holders to operate within a network to share expertise and coordinate access. Applicants are asked to provide details of the institutional environment into which the equipment will be integrated (e.g. existing facilities and related equipment, housing, technical and scientific support staff, plans for on-going management and maintenance of equipment). Multidisciplinary applications, spanning the remits of more than one Research Council, may be considered if the majority of the research in which the equipment will be utilised falls within our remit. Applications where the majority of the research falls outside our remit will be rejected (see 'Our portfolio' in related links). Applicants uncertain whether the science in their proposal is within our remit must contact us before submission. If an application contains components of proposed research that fall outside our remit, we may seek the advice of other Councils as part of the assessment process. Applications that include principal or co-investigators who are not eligible to apply for funding, and/or from ineligible organisations will be rejected. A research organisation may submit more than one application; however there is a limit on the number of applications from an investigator or consortium. Details of limitations are in the call guidance. Applicants should refer to the call guidance (see application downloads below). Applications must be submitted using the Joint Electronic Submission (Je-S) system (see external links) by 10 January 2017, 4pm. OpenPlant Fund offers £5000 to support open, interdisciplinary and innovative projects to engineer plant biology. Applications are now open until 1 Dec 2016 for projects led from University of Cambridge or Norwich Research Park with external collaborators welcome. For this round applications focused on cell-free synthetic biology are also encouraged. The aim of the OpenPlant fund is to promote the development of plant Synthetic Biology as an interdisciplinary field and to develop open technologies and responsible innovation in the context of plant Synthetic Biology. This call is also encouraging applications related to use of cell-free extracts from bacteria, plants, yeast or other organisms to transcribe and translate engineered DNA. Cell-free synthetic biology is gaining popularity for prototyping genetic circuits and metabolic pathways and has many applications from production of biologics to paper-based diagnostic tests and biosensors. OpenPlant Fund teams facilitate exchange between The University of Cambridge, the John Innes Centre, The Earlham Institute and The Sainsbury Laboratory and therefore are led by researchers from these institutions, but are open to all external collaborators. Join us at a mixer event at the Panton Arms on 21 November 2016, 18:00-20:00. 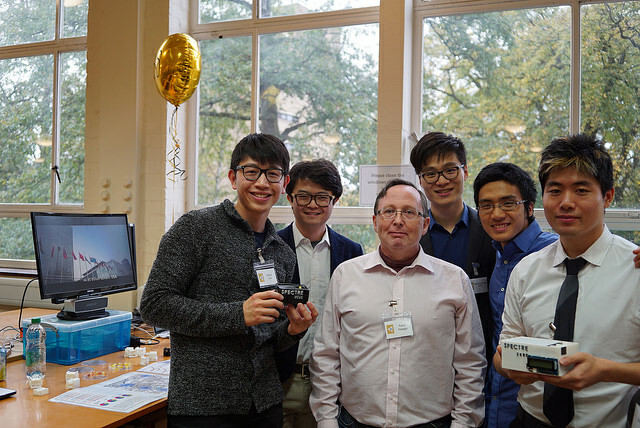 Great talks from a previous funded project on microfluidics and from the Cambridge spin-off Sphere Fluidics plus an opportunity to pitch your idea or find a team to join! For more information and to apply see the OpenPlant Fund webpage. SynbiCITE in partnership with Rainbow Seed Fund is running Bio-start, a competition to help promote the commercialisation the engineering of biology in the UK. Bio-start is an annual competition designed to commercialise the engineering of biology and is currently seeking people and companies looking to solve significant global problems through synthetic biology. The winner of Bio-start will receive up to £200K of equity free funding, labspace and access the London DNA Foundry. The competition provides entry into an accelerator programme with expert mentors and partners to support teams commercialise their ideas. For further information on Bio-start please click here. Deadline for outline applications: 4pm, 22 June 2016 Awards would start on 1 April 2017, for applications for proposals of ~24 months’ duration. All research funded through these awards will be part of the UK’s Official Development Assistance (ODA). Applications must be primarily relevant to near-term or long-term benefits to the health or prosperity of Low or Middle Income Countries. Note for Cambridge researchers:Cambridge Global Food Security and CambPlants coordinate a large network and can help you find the collaborators you need across the University for a multi-disciplinary proposal that meets the funding criteria. In anticipation of further funding calls in this area with a short turnaround (GCRF, Newton Fund, etc),the Global Food Security SRI are planning a series of Sandpit events on themes within Global Food Security to support Cambridge academics in generating and developing new ideas, finding collaborators (both within Cambridge and from external organisations), and submitting bids. Please let Jacqueline Garget – Coordinator of the Cambridge Global Food Security SRI - know if you would like to be involved in the events or if any research ideas you’re thinking of submitting that fall within the remit of the Initiative (www.globalfood.cam.ac.uk).